With the United States midterm elections coming up, this week’s Wetland Wednesday focuses on the roles of government in coastal restoration, specifically permitting and mitigation. Of course, each coastal parish has their own government and representatives, and the State of Louisiana has dedicated offices for coastal restoration. 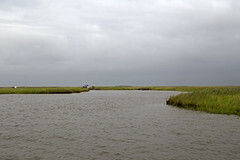 Anyone who wants to construct a restoration project in the coastal zone must go through the State of Louisiana Department of Natural Resources (DNR) to obtain the proper permitting, most commonly a Coastal Use Permit. The DNR requires all who apply for a coastal use permit to prove that they have sufficiently addressed the need for environmental damage mitigation. CWPPRA-funded projects are permitted through this office because they have sufficient positive environmental impact. Our engineers and managers must prove that they have done the necessary surveys and sustainable development plans. Other coastal uses that require permitting include dock construction, dredging and infilling, and oil well capping and abandonment. All permits are distributed with the intent of preserving net ecosystem integrity, meaning that if there is a large impact at the project location, damage mitigation measures are required. Recent legislation at the state level has been moving toward the idea of “Environmental Banking”,  which would allow developers to invest in the coastal zone, providing funds for restoration and earning credits that can be cashed in for mitigation needs. This process would get dollars on the ground in advance to help fund restoration. Since local damage is so common in development, environmental bank investors must invest in the bank that deals with the zone they will want to develop. CWPPRA was enacted in 1990 to minimize coastal land loss. One of the most important goals of our projects is to provide a net benefit to the local environment. Legislation and permitting allow us to do this vital work, and we appreciate the efforts in Louisiana toward responsible coastal use. We hope everyone, both in government and the larger public, continues to view coastal land loss as a serious threat to the economy, ecosystems, and civilization.